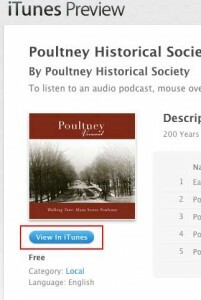 Click the “Download our Tours Podcast” link here or at the top of the Podcast page. 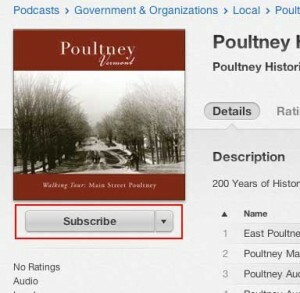 This will take you to the Poultney Historical Society page in Apple’s Podcast Directory. iTunes may launch at this point, if so skip to step 4. Click the blue “View in iTunes” link to launch iTunes on your computer. Once in iTunes click the “Subscribe” button.